This non-magnetic MRI brake grip is constructed entirely of non-ferrous materials. It is specifically suited for use in MRI rooms. All materials including fasteners are either non-ferrous materials or special polymers. 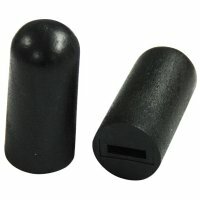 Black rubber grip for wheel locks help keep a firm grip on your brakes. Make sure your brake grips are in good condition, a bad brake grip could be a serious problem with operating your wheel lock. Grip Slot Size: 5/8" x 1/8"